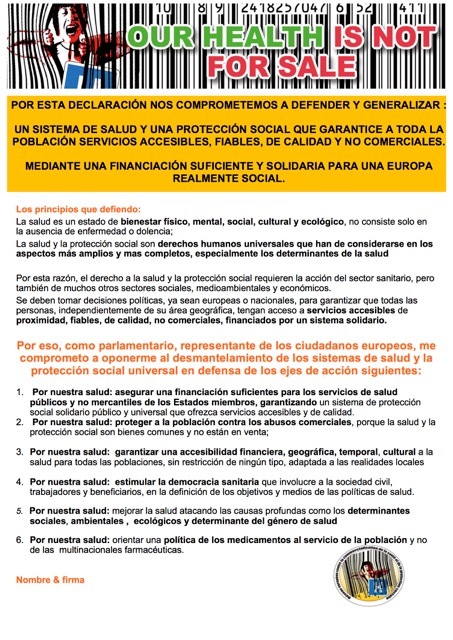 The European Network against Privatization and Commercialization of Health and Social Protection, meeting on November 16 2018 in Barcelona, stressed that the mechanisms for privatization and commercialization of health and social protection are expanding throughout Europe, driven by neoliberal policies "everything for the market". This observation is based on the realities of many countries for a wide range of health and social protection sectors. The commercialization of health has disastrous consequences on access to health care (geographical, economical, temporal, cultural...)  and thus an increasing exclusion of important groups within the population ; women, youth, unemployed, elderly, people with disabilities, migrants... are the first victims. The precarity, fear and resignation that has followed has created a fertile ground for the extreme right-wing demagoguery. The absence of a social Europe and Europe’s neoliberal policies allow local authorities to designate Europe as the sole cause and responsible for all these evils. 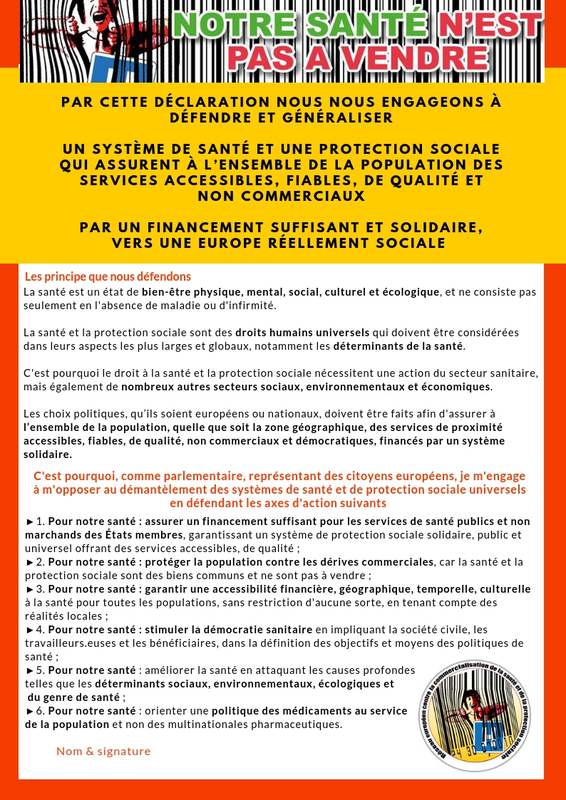 More than ever, the European Network reaffirms the need to protect and generalize the European social heritage of social protection systems such as social security, but also social policies aimed at addressing the social determinants of health (education, housing, working conditions, the environment, etc.) , as proclaimed in the European Social Charter. 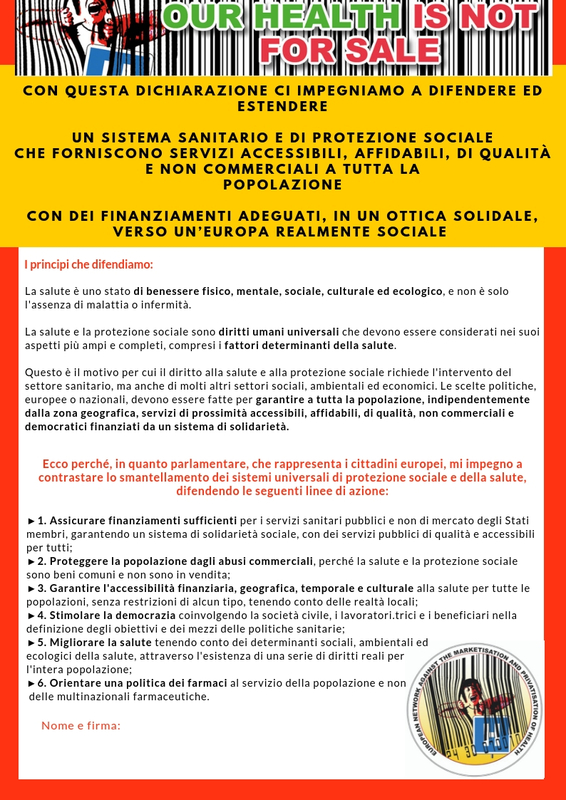 decided, as part of a European mobilisation, to organize in Brussels, around 7 April 2019 - European Day against the commercialization of health - a European demonstration and a conference with the signatory parliamentary groups. decided, in the meantime, to inform, raise awareness and mobilize locally, through member organizations and allied networks, in order to create a united and plural front of struggles. 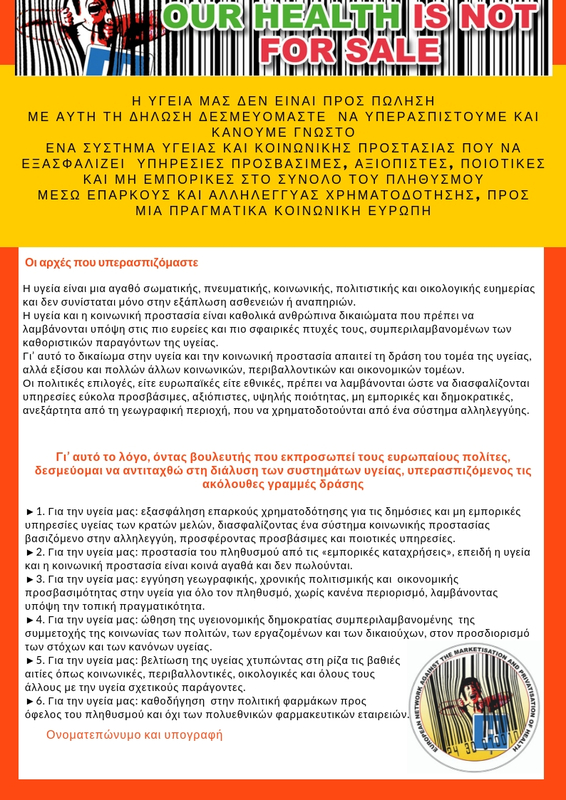 Our aim: to converge local struggles to defend public health with a real capacity for action at the European level. Fighting together for Public Health for all! Health is a state of physical, mental, social, cultural and ecological well-being, not just the absence of disease or infirmity. 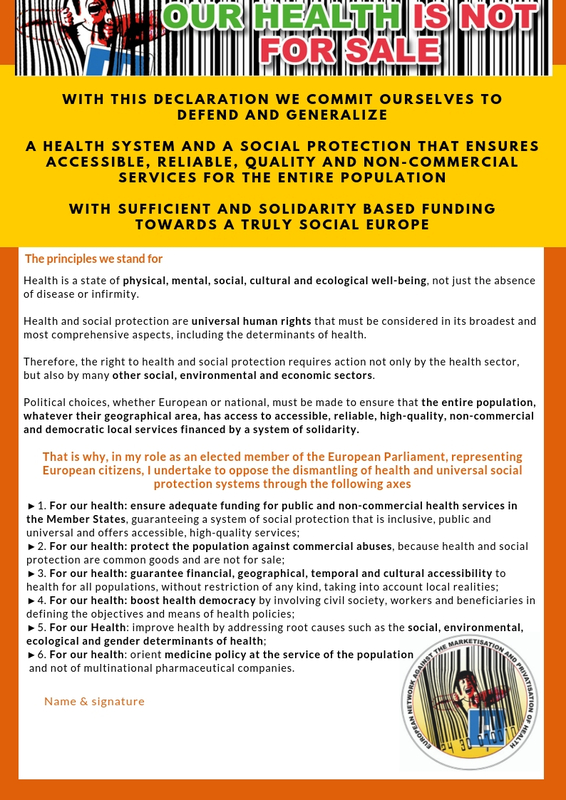 Health and social protection are universal human rights that must be considered in its broadest and most comprehensive aspects, including the determinants of health. Therefore, the right to health and social protection requires action not only by the health sector, but also by many other social, environmental and economic sectors. Political choices, whether European or national, must be made to ensure that the entire population, whatever their geographical area, has access to accessible, reliable, high-quality, non-commercial and democratic local services financed by a system of solidarity. For our health: orient medicine policy at the service of the population and not of multinational pharmaceutical companies.